Imagine for a second that you were rehearsing whatever show it is that you are currently working on, with a group of 4-5 collaborators. So, you are in your rehearsal room, hammering it out, working on the script, figuring out the blocking, etc. And then, in walk 4 other groups, to share your room. They are also rehearsing with their props, costumes, text, choreographed fight sequences, etc. 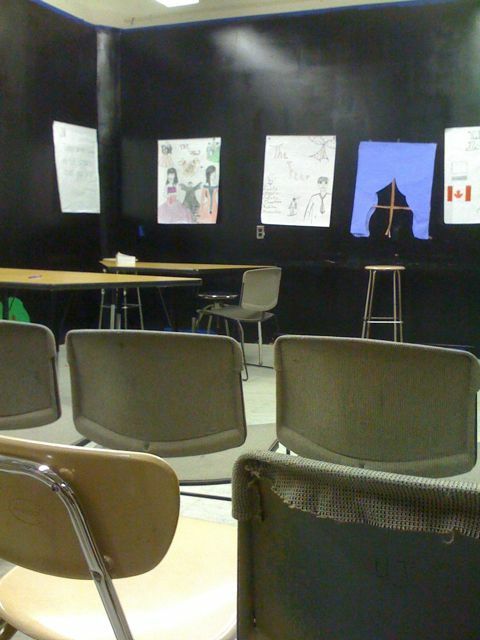 This is the situation in the typical NYC public school classroom that I walk into. There will be 30 students, rehearsing simultaneously in a space the size of your living room. If you have a big living room. I could probably only fit 4 students in my living room. But, you get the picture. This was the situation yesterday at an International High School in Queens where I was doing some residency culminating performances. The answer is that in working in schools, doing drama, this is the way it is. We make it work, somehow. But, unlike the fine arts, or perhaps even dance, this means a lot of chaos, more chaos than people are used to seeing in classrooms. I taught with two guest teachers as my primary colleague was out. Part way through the first class, the two guest teachers shot some looks over, like, “are you mad?” The noise. The questions. The fact that students were using broomsticks as faux swords. This is not what English class normally looks like. But today, it is okay and I must also make them comfortable in the room. I ask one teacher to model an activity with me to draw her in. Show the students that she too will take the risk to get up and work in front of them. I was to teach around the question, “What is point of view? And how does a story change depending on who’s telling it?” And I ended up needing to teach each class very differently depending on the student group dynamics and language comfort. While I came in with a plan, I ended up changing things on the fly, in order to better have them understand POV and be able to tell a story from a different character’s point of view. When it came time to show the pieces the students magically whizzed together in a few minutes, the teachers seemed to enjoy them and were impressed with how much the students showed that they knew about the play, how inventive they were, how they moved through their shyness and varying levels of language acquisition challenges to create a moment of theater. And perhaps I re-learned, we are always in process as teachers and artists and teaching artists. And we have to change things on the fly sometimes, because what we’re doing is not working. Or could work better. Our instincts are usually right. And momentary chaos is often okay. As long as we are seeking the answer to the driving question. Instincts are right. Chaos is good. This will be my mantra. Sounds like first-year Workshop! Except much more fulfilling.